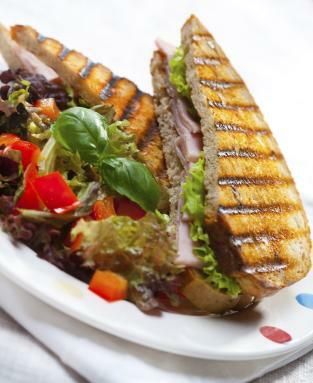 Gourmet sandwich recipes can turn a basic lunch into a delicious occasion. Move beyond basic techniques and ingredients, and the everyday sandwich becomes a gourmet extravaganza you'll want to make again and again. Basic sandwiches typically contain bread, some type of filling such as peanut butter, egg salad, or lunch meat and condiments. Gourmet sandwich recipes contain the same structure, but by switching out ingredients and tossing in a few basic techniques, the sandwich goes from everyday to gourmet. If you're a fan of grilled cheese, you'll love Panini sandwiches, which are just a twist on a basic toasted cheese sandwich. If you want to get fancy, purchase a Panini press; you can also use a Foreman grill or the flat plates of a waffle iron to grill up your bread to crispy goodness. The basic Panini technique is simple. Spread your bread with a condiment, add meat and cheese, brush the outsides of the bread with butter or olive oil and cook in a Panini press until the cheese melts and the bread is crispy. With that basic technique in mind, consider the following variations. Three-cheese: Fill a hearty whole-grain bread with slices of Swiss, Havarti and grated Asiago. Brush the outside of the bread with olive oil and grill. Chicken-pesto: Slice crusty French bread, and spread with store-bought or homemade pesto. Top with Havarti cheese and chopped chicken. Brush the outsides of the bread with butter or olive oil and grill. Veggie and Cheese: Spread two slices of sourdough bread with cream cheese. Top with jarred roasted red peppers, sun-dried tomatoes and baby spinach leaves. Brush the bread with olive oil and grill. Prosciutto, roasted pepper, and mozzarella: Fill crusty Italian bread slices with thinly sliced prosciutto, roasted red peppers and sliced mozzarella cheese. Drizzle with olive oil and grill. Roast beef and caramelized onion: Brush the inside of a sliced open ciabatta roll with melted butter. Add caramelized onions, Italian roast beef and sliced Swiss cheese. Brush the outsides of the ciabatta with olive oil and grill. This Italian sandwich, which is made on a round loaf of peasant bread, feeds several people. A traditional muffaletta contains olive spread, Genoa salami, Mortadella and provolone. Combine olives, capers, red peppers, celery, parsley, garlic, vinegar, salt and pepper. Refrigerate overnight. Spread half of the olive spread on bottom half of bread. Layer with meat and cheese. Top with remaining olive salad and top round of bread. Press together, wrap in plastic and allow to sit for at least one hour. This traditional New England sandwich provides a gourmet twist on a typical tuna salad sandwich. Combine lobster, celery, mayonnaise, salt and pepper. Brush both sides of hotdog buns, and toast under a broiler for about two minutes per side. Fill buns with lobster salad. Try these gourmet sandwiches and bring your typical lunches into something out of the ordinary. The results are sure to have you searching out other gourmet sandwich recipes.